The 0.5x Barlow is definately a great move. I really appreciate the 8″ working distance on mine, especially if you’ve got flux spluttering around when your working with rosin-core solder. As for the import models having problems, I bought mine off ebay and couldn’t be happier with it. I’m impressed with the optical and build quality, and the only thing I’ve had to change was adding a bit of lubricant on the shafts so they don’t squeek when I move the head around. Couldn’t be happier for the price, though, and regularly recommend them to others. The large working distance is very helpful. 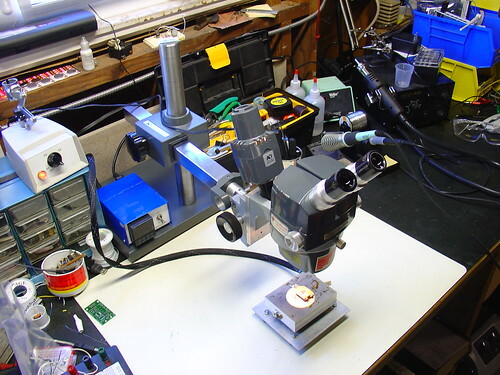 The biggest downside to a large working distance is that sometimes, especially if the work is sitting on something (like my hotplate), the eyepieces can end up pretty high off the bench. I actually had to buy a better adjustable height lab chair so that I could sit up high enough to use the scope in all conditions. If you post the make/model # of your scope as well as where you found it on ebay, I’m sure that other visitors to the site would find that information very useful. I had a very hard time finding reviews of the import scopes when I was looking at them on eBay. That is what ultimately led me to buying an older domestic model instead. 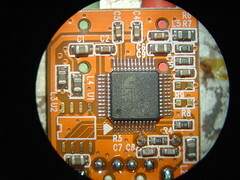 It’s great to hear that the import scopes work well, they certainly are affordable. 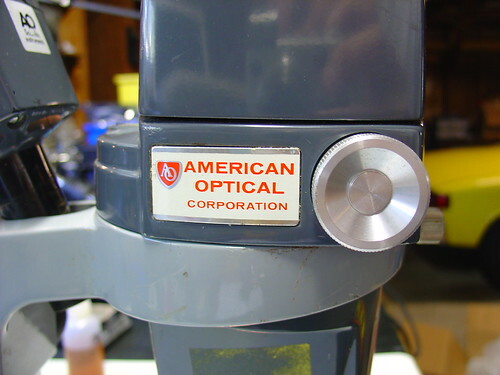 I ended up buying a 0.5x secondary objective direct from Reichert, who acquired American Optical’s microscope line. Thanks for the pointers to other suppliers, this will no doubt help others looking for parts and accessories for AO scopes. At some point I’ll be looking to purchase a fiber optic illuminator, so I’ll have to give these guys a call and see what they have available. Nice work! You might try looking at Surplus Shed for optical components. I’m looking for a 0.5x secondary objective/Barlow lens for the scope. 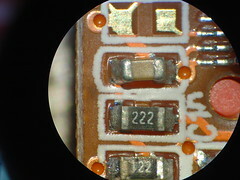 The original for this scope is an AO part# 575. If anyone knows where to find one, contact me. Thanks!